PARVOVIRUS – A highly infectious virus that even the mention of the name, rattles most pet owners. Is it any wonder that the recent news dominating the media mentioning a new strain of the disease is causing distress in the pet owner community? For the first time a new canine parvovirus strain (canine parvovirus 2c or CPV-2c) has been identified in Australia. We are here today to tell you to STOP PANICKING! Let us shed some much-needed light on this emerging situation. 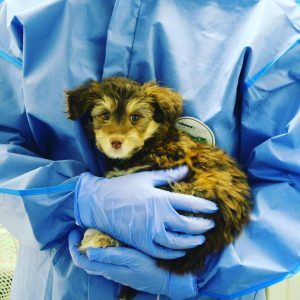 What is Canine parvovirus (CVP)? Canine parvovirus is a highly contagious viral infection that primarily attacks rapidly dividing cells in dogs notably in the gastrointestinal tract. 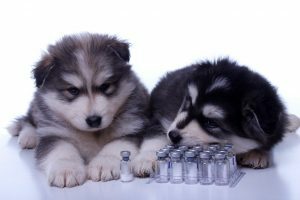 The growing nature of puppies is why unvaccinated young puppies are so highly susceptible. The virus is transmitted either by direct contact with an infected dog, or indirectly through faecal matter from an infected dog. The virus can survive in the ground for a number of years and be transferred on shoes and clothing. 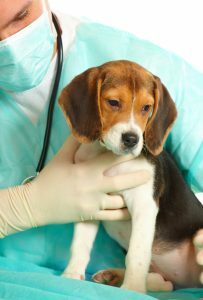 What is the new Canine parvovirus: (CPV-2c)? This disease actually isn’t new. Known at CPV-2c it is just another variant of the original canine parvovirus and is present today along with other strains. It has been active worldwide for a number of years but has only recently become apparent in Australia. CPV-2c can infect dogs of all ages and only differs from the original virus at one point of the parvovirus DNA strand. The disease is still highly infectious and contagious in dogs and requires the same precautions as the pre-existing virus. If your pet contracts the disease, early detection and intensive treatment is advised. This is no different to the current parvovirus, with symptoms and prognosis remaining the same. You said not to panic? I’M PANICKING! Cool your jets. Present vaccines covering the original Canine parvovirus are multivalent and cover all versions of the disease including CPV-2c. Furthermore, CPV-2c can be detected and treated just like any other version of the virus, using the same tests and treatment plan. Just like the commonly known Parvovirus, vaccination is the best prevention. If you have an unvaccinated or overdue pet, they are most certainly at risk. If your pet has succumbed to the disease, early diagnosis and treatment enhances chances of survival. Pets infected with CPV-2c present clinically with the same symptoms as the original disease. Similarly, if left untreated, mortality rates are high. Unvaccinated pets are at the highest risk and with cases of parvovirus currently high; prevention is better than cure – and cheaper too! If you’ve heard it once, you’ve heard it a thousand times. VACCINATE YOUR PETS – including booster vaccines. Vaccinations are the best chance of prevention for CVP-2c and just the same as the original CVP. The current vaccines used in Australian veterinary clinics immunize your pet against all variants of the virus including CVP-2c, along with other significant deadly diseases. If you own a young puppy, ensure they remain at home mixing with only vaccinated pets until they are fully vaccinated, including all boosters. Just don’t risk it – it isn’t worth it! Just like a young baby. Studies are continually being carried out to gain further understanding of this disease already present throughout the world. We urge you remain calm and merely implement increased awareness of its presence and to take precautionary action utilizing the vaccines proven to protect your pooch from this new version, and old alike. The emergence of this virus in Australia does not mean it’s a time to panic – it is merely a timely reminder ensure your pets vaccinations are up to date. If not – keep your pet safe and make an appointment with your local veterinarian today! For more information on Parvovirus including symptoms visit our website: www.animalemergencyservice.com.au and view our post on parvovirus.